Facial acupuncture has been recorded to be used by the Chinese since 960 ad, by the Chinese Empress herself. Facial acupuncture is a holistic, natural, and safe approach to improve your skin from the inside and the outside. Reported benefits may include: reduction of fine lines and wrinkles, improved muscle tone, improved circulation to the facial skin, better skin complexion and texture, increased skin elasticity, a reduction in dark circles under the eyes, and an overall increased sense of health and wellbeing. 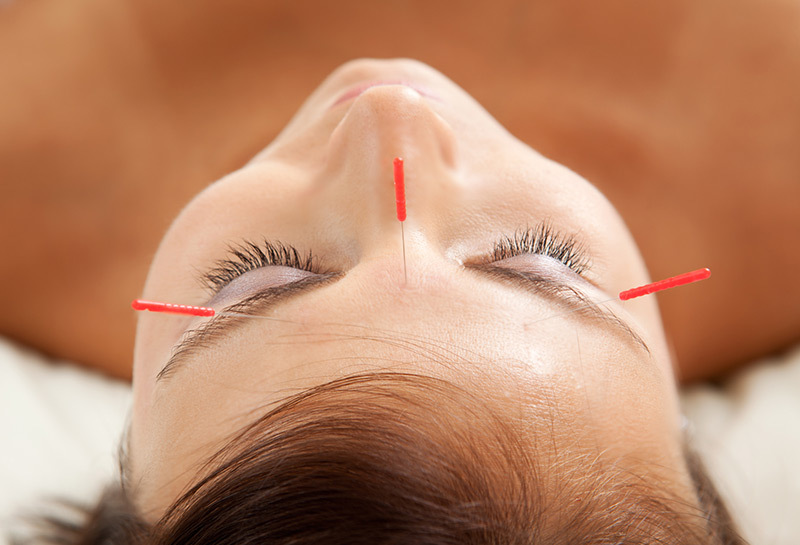 How does it Facial rejuvenation Acupuncture work? Extremely fine needles are used in points on the body; with the aim to improve inner health and aid relaxation, and points on the face; to target fine lines, wrinkles, improve circulation, and increase elasticity of the skin and tone of the facial muscles. It is reported that facial acupuncture increases the water and oil content in the skin and aids the skins natural production of collagen to lift out the fine lines and wrinkles. Detox points can also be used through acupuncture points on the ear, which is believed to target organs such as the liver, impairment of the liver can lead to wrinkles, dark spots and a dull complexion, kidneys, impairment can lead to accelerated age, contributing to wrinkles and thin hair, the spleen, impairment of the spleen can lead to skin losing tone, sagging, and puffiness of the face and eyes, the heart, points can be used to calm the heart as stress can cause wrinkles, the lungs, impairment of respiration can lead to dryness of the skin (Jonathan Hobbs, Facial Rejuvenation Cosmetic Acupuncture Course, May 2017). Does it work as well as Botox®? The results from facial acupuncture are more natural, restoring a vibrant glow to the face and hence helps you look your best. Facial rejuvenation acupuncture doesn’t use any chemicals or anything artificial. Results from facial rejuvenation acupuncture are not as instant (or dramatic) as alternative cosmetic procedures (for example Botox or facelifts). After a course of treatment, you should look like a rejuvenated and healthier version of yourself, as if you have just returned from relaxing holiday. It is much safer than alternative ways to reduce your lines and wrinkles. It is less intrusive and has many other benefits, not just your appearance. It is becoming more and more popular with many celebrities now turning to acupuncture to fight the signs of aging. Why choose a physiotherapist to reduce the appearance of lines and wrinkles? Claire and Sarah have been practicing acupuncture for many years, using it successfully for reducing pain. They began practising facial rejuvenation acupuncture as the popularity of this form of beauty treatment increased. By receiving facial rejuvenation acupuncture from Claire and Sarah you can be confident in their training, professionalism and confidentially. You have added reassurance that they are registered, and chartered physiotherapists dedicated to delivering the highest quality of treatment and care. Claire and Sarah are also members of the Acupuncture Association for Chartered Physiotherapists (AACP) and have completed the Facial Rejuvenation Cosmetic Acupuncture Foundation Course to deliver safe, effective and up to date treatment. On your first appointment a full assessment of your lifestyle, problem areas, goals and expectations will be explored to guide treatment. For facial rejuvenation acupuncture to be administered, you will be laying down on a plinth, with pillows for comfort. We will provide a headband to keep your hair away from your face during the treatment. You will want to wear comfortable clothing and may need to expose your lower legs and arms. Depending on your individual needs, Claire and Sarah may decide initially to carry out a detox treatment which would involve acupuncture needles being inserted into your ears and lower leg. This is to support your overall health, improving circulation, complexion and your general wellbeing. Total Care Physios are also Tropic Skincare Ambassadors, as the core values and ethos of the company are similar to Total Care Physio. Tropic products are free from any nasty chemicals and one of the few companies leading the way in compassionate and ethical beauty products, being certified by PETA, Cruelty free international (the leaping bunny symbol) and the Vegan Society; beauty with a conscience. Their ethos is pure, honest, and effective. Also very importantly they are a carbon negative company, meaning they add to the health of our environment and don’t take away from it. Their skin range is 100 percent naturally derived, made fresh, having the highest nutritional value for your skin, with no artificial preservatives. Tropic informs us that 75-95 percent of the products on the market today are full with parabens and similar chemicals, partly because they are cheaper. Unfortunately 70 percent of what we put on our skin is absorbed into our bloodstream which can cause more harm than toxins that we eat. For these reasons, Total Care Physio will only be using Tropic Skincare products during the cosmetic acupuncture treatment. All make up will need to be removed prior to your beauty treatment, don’t worry if you have makeup on as this can be removed with our Tropic Smoothing Cleanser, which we use to cleanse your face before using the fine needles. Once the needles are removed, we use Vitamin Toner and Skin Revive (Tropic ABC Facial) to increase local skin circulation and aid treatment. We may use serums, choice between Organic Elixir or Super greens, if it is seen advantageous to do so. Also during the treatment you will have the option of choosing a relaxing foot or hand massage. As Tropic Ambassadors, the full range of products are available to purchase through ourselves. For your fine lines and wrinkles, several needles will be placed into these areas, concentrating on where you consider to be most problematic. These needles will be left in for a set time depending on your needs and then slowly removed. There may be some discomfort whilst the needles are being inserted. It is best not to have your treatment around the same time as a big social event as there is a possibility of small red marks or bruising where the needles have been. Results vary between individuals but accumulate over a course of sessions. Treatment will vary between individuals but generally it is recommended to have weekly or twice weekly for an initial 6-12 sessions then once we have achieved the desired result this will need to be maintained with monthly or every 2-3 months. Reading classes to complete our questionnaires so we can learn about your lifestyles and facial routines. Your own facial cream, if you have a cream you partially like for your skin, if not we will use our Trpoci products. SAVE 15% (£63.75) if you decide you would like a course of treatment then we can offer you this at a discounted rate of only £382.50 for 6 sessions (requires pre-payment of the total fee). Want to discuss or book this treatment? For Rejuvenating Facial Acupuncture treatment with our expert physiotherapists in Norwich and South Norfolk, arrange an appointment today.